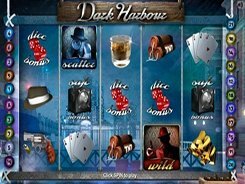 Dark Harbour is a gangster-themed slot with 5 reels and 21 paylines. The slot has detailed and realistic graphics as well as two amazing bonus games where you may win a decent cash prize. There are two adjustable bet options: the number of active paylines and a line bet ($0.1 to $0.5), thus the minimum and maximum bets are $2.1 and $10.5, with all paylines enabled. The symbol set includes a hat, a smoking cigar, four aces, a revolver, gold bullions, dollar packs, and other themed icons. The slot features a scatter, a wild, the Dice Bonus and the Safe Bonus. The Dice Bonus is activated by five dice symbols landed on a payline. When this happens, you are taken to the second screen displaying a game board. You will have to roll a dice and move around the board landing on different spaces that award multipliers. Another bonus feature known as the Safe Bonus is actually a pick-to-win mini-game where you are to select one of a few safes that will then reveal a random cash prize. The maximum jackpot prize you may win in the game is $10,500; this is awarded for hitting five scatters (a Detective) anywhere on the reels. PLAY FOR REAL MONEY!